As mentioned, a stream diversion on the property meant that a large farm pond and short section of stream needed to be dewatered and infilled. But due to an unusually dry summer, the surrounding stream was largely dry, and therefore the farm pond provided the only permanent habitat for fish within this section of stream. And as a result, the pond was found to be teeming with eels - thank goodness the team aren’t squeamish! As well as the large community of eels who had made the pond their home, the pond was also found to be filled with soft, silty mud and was unsafe for people to access. So instead of tackling the pond themselves, the 4Sight team worked closely with the project’s earthworks contractors as they progressively dewatered the pond. How does an earthworks company assist with such a delicate operation you ask? Using a long reach digger, that’s how. The long reach digger operated by carefully scooping bank vegetation and sediment from the pond and then spreading it in a shallow layer along the nearby banks to enable the Ecology team to search for the fish by hand. The first bucket load produced a staggering number of eels, in which literally hundreds of eels (300+) of all sizes slithered off in all directions. But with so many eels trying to make a run for it, the team had to be quick off the mark, capturing all the eels before they could escape. They then had to do a final search through the mud to ensure that every last eel was caught and none were left behind. The sheer number of eels being pulled from the pond continued to be astounding, and it quickly became clear that in order for the safe relocation of every eel to occur, the team needed reinforcements. Luckily, we are a multidisciplinary bunch here at 4Sight and because of the diverse range of experience available within our wider team, the Ecology team were able to call upon and bring in a larger field team to ensure that the fish captured, and subsequently relocated, happened as quickly as possible. Given the hot weather conditions, this was vitally important to minimise the stress on the native fish as well. Over the next four days, more than 2,000 eels were recovered from the pond and regularly relocated to sections of the same stream, but downstream of the works site. The fish recovered were almost entirely shortfin eel (Anguilla australis), although small numbers of the increasingly rare longfin eel (A. dieffenbachii) were present too. The eels ranged in size from elvers (c. 70mm in length) to large adult eels (up to 1,000mm in length). 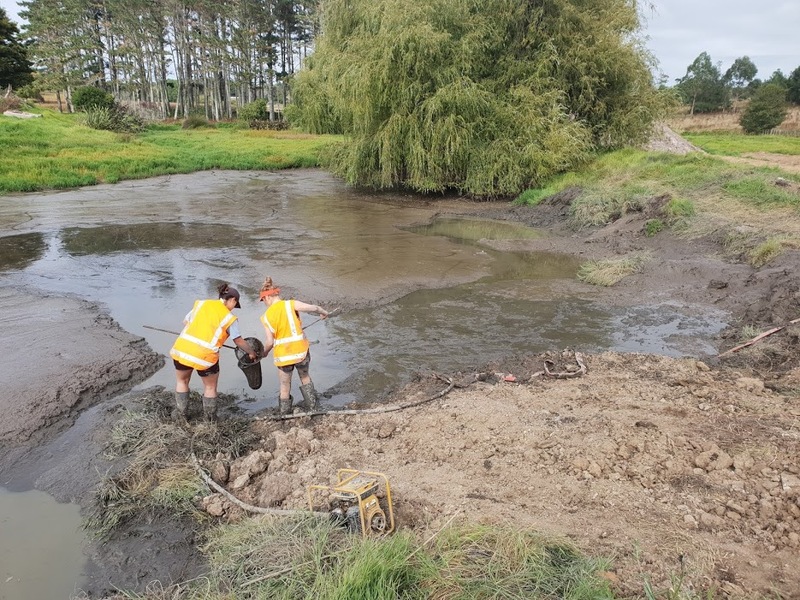 But what was really exciting for the team was the fact that they were able to assist in removing an existing large fish barrier to reconnect the 94-hectare upstream catchment and stream habitat that was previously inaccessible to all but eels, as they are the hardiest climbers. Re-connecting these ecological corridors and improved fish passage throughout the catchment will in turn provide an opportunity for a more diverse range of native fish species to move into the area next spring / migration season - not just the eels. However, because the eels were only moved just downstream of the development area, the team anticipate to see them remain in the area too. All in all, it was a very successful relocation and despite the heat and endless mud, the team managed to produce an outstanding result. Not only for the client, but for the native fish as well.